Beach chairs and umbrellas individually equipped (no 'chicken-bar look'). In the garden under the mimosa is still a simple communal kitchen for cooking sessions, an old tree trunk long table with benches and chairs and ..... Sea views. In summer the rock is fantastic iluminiert of the setting sun. Table tennis and hammocks available. !!! For Gecko 2 + 3 together long term renters welcome !!! The studio Gecko has a fantastic view over the valley, village, Tramuntana mountains, "our" rocks to the sea. It fascinates with its big windows and the ceiling height !! Sea-u. Panoramic views, pure nature, large garden: the chalet is located in the countryside, 5 minutes from the center Estellencs Kosljunska. For natural gravel beach walk about 25 minutes. The garden is a small paradise (7000qm) with lots of mature trees: olive, pine, oak, locust, mimosa (blooms in winter), Lemon Tree (blooms all year), Poplar., Oleanders and many plants such. B.Aloe vera and flowers. It is ideal for nature lovers, bird lovers, hikers, photographers, painters, writers, musicians (good acoustics), and people who like to make their holiday individually, the herb garden can be gladly used. Several trails go directly from the plot. From the roof terrace you have a sublime view over the village, valley and the sea and in the summer 'our' rocks glow in the setting sun. Estellencs - excellent !! Estellencs has about 400 inhabitants and offers (almost) everything - in the summer are of course many international guests here. Excellent restaurants, cafes, bars, pizzeria, small supermarket, pharmacy, wine-growing and selling, specialties, post office box, EC Machine (?). Bus to Palma and the surrounding area available. To explore the island a car is recommended. The best time for hiking and cycling, beginning of the season. Our pool has now salt water and in May he rapidly overtaken the sea temperature. And the weather is perfect for exploring the island (car recommended). About 3 hours descent also belong. To the sustained impressive and beautiful experiences. Enough water and food and sleeping bag !!!
. Particularly attractive is a combination of nature and culture, for example, in September: You can swim, hike, explore island and go to Palma for the Nit de l'Art (ca. In mid-September), an annual art event: All galleries are open until midnight, many bars and cafes also. Who comes to Christmas, can attend the German service in the cathedral of Palma, 15th 30h u. 17, 00h, and then go shopping at midnight on a big bonfire in front of the village church in Estellencs with locals decide the evening. The New Year's Eve and the Three Holy Kings are also celebrated in the church square in Estellencs campfire. New Year's Eve with grapes and cava (sparkling wine) and then DISCO, and 5 1.abends to 19 h 00 come the 3 Wise Men on Mororrädern (who also live in the 21st Century), presents cars, fireworks, and then with hot chocolate and ensaimada. The bright bathroom has a shower room. If you are looking for rustic charm, then this property is for you. Ideal for romantic couples wanting peace and quiet with privacy. Irene is the ideal host as although she lives on the property, she leaves you alone to chill out and feel fully relaxed. We stayed in Gecko 1, which is small but is equipped with everything you need - and the private roof terrace is idyllic place for star gazing at night. Estellencs is a small village with about 5 restaurants and a convenience shop. 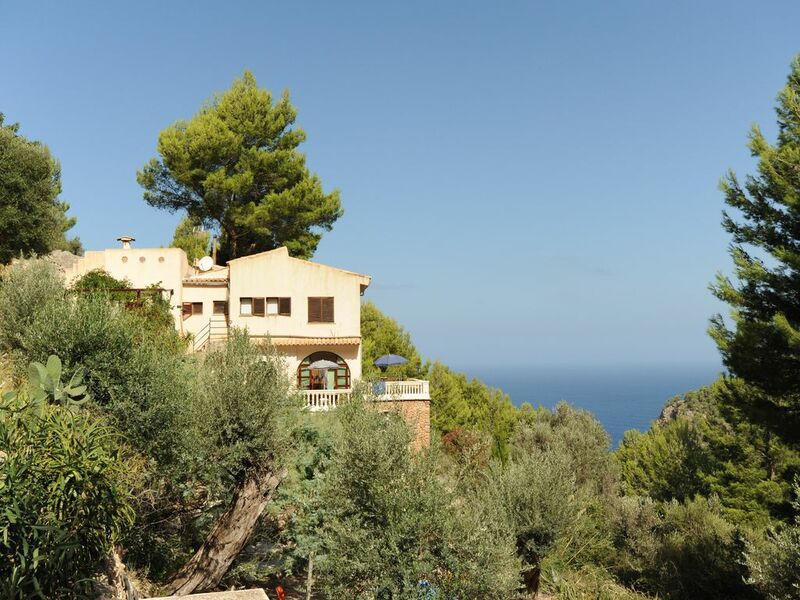 It's set in the hills of West Mallorca, so ideally you need a car to get around to visit the nearby Port Andratx or beach resort of Camp de Mar. This was an ideal location for our first romantic holiday together - ideal for young couples who like peace and quiet to totally relax. we enjoyed our little Gecko hideaway in the hills of beautiful Mallorca. where we truely relaxed and enjoyed the soleil and tapas. If I could assess my guests : 5 hearts for you !!! Zitronen- und Oliven-Bäume, Pool und Dachterrasse, was will mensch mehr? Irene ist eine sehr aufmerksame, zuvorkommend und herzliche Gastgeberin und hat wirklich an alles gedacht. Wir wurden sogar mit einer Flasche Wein und einem Vorrat an Wasser begrüßt bei unserer Ankunft spät nachts. Auch hatte sie viele tolle Tipps für Restaurants, Ausflugsziele, und Wegbeschreibungen für uns.die Kommunikation war immer unkompliziert! Das Appartement Gecko 1 ist klein aber fein und es gibt alles, was wir benötigt haben. Auch hat uns der Garten besonders gut gefallen... Sterne gucken von unsere Dachterrasse oder der zweiten Terrasse (ja, wir hatten zwei Terrassen! ), den Vögeln und der Stille lauschen oder unter Oliven-Bäumen und einem Zitronen Baum am Pool entspannen - für uns war der Urlaub perfekt und wir kommen bestimmt wieder! Und zur Umgebung - einfach wunderschön, zum Wandern oder Radfahren oder einfach nur die Landschaft genießen. Habe den Aufenthalt sehr genossen. Die Unterkunft war mit allen Ausgestattet was das Herz begehrt. Irene die Gastgeberin war für einen immer zu erreichen und ist auf besondere Wünsche sofort und unkompliziert eingegangen. Denke die Ferienwohnung nochmal in Anspruch zu nehmen und werde jene auch Freunden und Verwandten weiter empfehlen. Wir hatten Pech mit dem Wetter! Es war kalt und regnerisch. Bei besserem Wetter hätten wir Terassen und Pool sicher genossen, so wären wir auf das Appartement angewiesen. Dafür ist es leider zu klein und es fehlt an gemütlichen Sitzgelegenheiten. Die Umgebung ist schön, ein Auto ein Muss! Alles in allem war es OK.
Umgeben von Felsen und Bäumen, mit Blick auf das Tal von Estellencs und das Meer, liegt das stilvoll gestaltete Apartment (Studio) mit seinen riesigen Fensterbögen, durch die man nachts den Sternenhimmel betrachten kann. In den heißen Sommermonaten lässt es sich hier sehr gut leben. Der große, etwas wilde Garten bietet viele Schattenplätze und einen gepflegten Pool, die Außenküche lädt zum entspannten Kochen und Grillen ein. Zum Dorf sind es nur wenige Minuten zu Fuß, zur örtlichen Bucht (kein Sandstrand) läuft man ca. eine halbe Stunde durch ein paradiesisches Tal. Die Eigentümerin (Irene), haben wir als sehr aufmerksame und zugewandte Gastgeberin erlebt. Wir haben unseren Aufenthalt sehr genossen und kommen gerne wieder. Golf: The nearest golf course is approximately 30 km away in Camp de Mar.